For Elio Ortiz the end came in round four after he visited the canvas a fifth time at the hands of Teddy Reid. Reid himself had been rocked and wobbled more than once in a sloppy but fun brawl in the Miami Arena and it now seemed unlikely that the main event, a showdown between Brazil’s Acelino Freitas and Argentinian contender Jorge Rodrigo Barrios, could exceed the prelim for excitement and fireworks. But it did, because the atmosphere for it to do so happened to be just right. That said, the arena wasn’t full that night, not even close. Only about 2500 paying customers were on hand, and yet there was no mistaking that battle lines had been drawn. The Brazil vs Argentina rivalry in football (or soccer, if you prefer) is a fiercely nationalistic one, played out roughly once a year on the field, and likely a holdover from armed conflicts between the two bordering nations. Despite political tensions cooling considerably, the rivalry hasn’t faded, even between legends Pele and Diego Maradona. However arcane, however counterproductive, there’s history there. Upon the announcement of Freitas vs Barrios, Sampson Lewkowicz, the boxing manager and promoter from Uruguay, said, “This is the biggest fight that can be made between South Americans and it will be a classic battle for national pride.” He wasn’t wrong, and what most boxing fans didn’t realize is that it was an extension of a bitter nationalist feud. 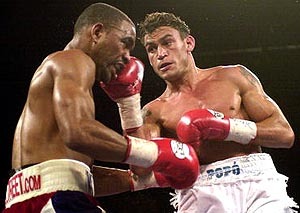 Freitas was a fresh-faced superstar whose personal life was fodder for the tabloids in Brazil, but as a fighter he had racked up 29 stoppage wins in a row. His reputation as a knockout artist took a hit after he went the distance with both Alfred Kotey and then Joel Casamayor, the latter involving a slightly controversial decision and some bad officiating. 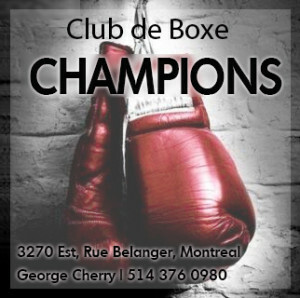 In Freitas’ next fight Daniel Attah raised more questions when, despite losing a wide decision, he was able to pepper the champion with clean shots, and then Freitas looked sloppy in getting a stoppage over Juan Carlos Ramirez. He managed to keep winning, but going into the fight with Barrios, Freitas’ world was in fact crumbling around him: his father had lost a battle with cancer, and his wife was divorcing him. Some thought Freitas fortunate to get the nod over Casamayor. 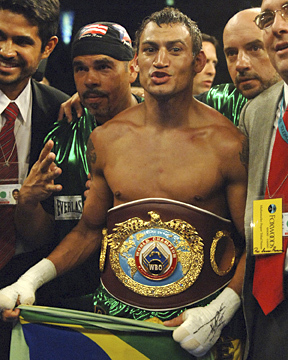 A far more jagged, rough-cut character, Barrios was unknown to most boxing fans outside of Argentina, and his reputation had been that of a local tough before he racked up some meaningful wins. Even before turning to boxing full time, Barrios was a literal street fighter who also worked as a security guard at a bowling alley. Regular appearances on the Argentinian boxing program “Combate Space” established him as a wily windmill of a man whose fights could go in any direction. He came to be known as “La Hiena,” or “The Hyena,” for his infectious laugh and devil-may-care approach to life, inside and outside of the ring. The same year that Barrios suffered his only defeat to that point, a disqualification to Cesar Domine in 1997, he was named “Prospect of the Year” by the boxing press in Argentina. 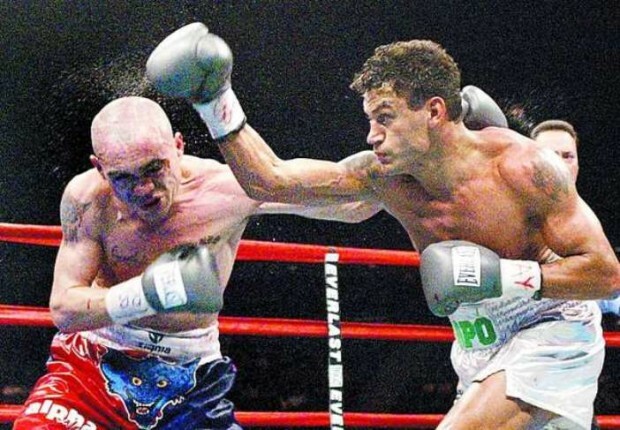 He wasn’t untalented, having turned down a likely spot in the 1996 Olympics to instead fight as a professional, but Barrios was often accused of using his head and elbows excessively, perhaps a product of fighting with too much abandon. Of Barrios’ 39 wins, 29 came inside the distance, however messy. 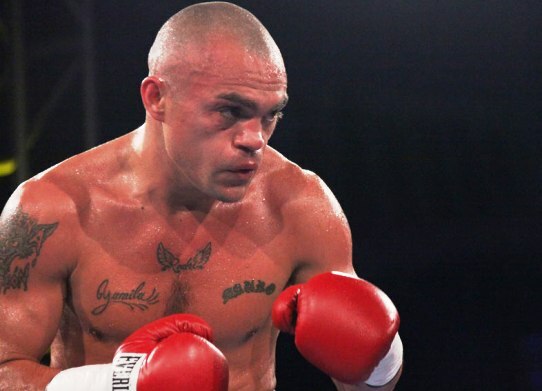 But flattened nose, scar tissue and all, against Freitas he was a 4-to-1 underdog, with 3-to-2 odds that the fight would be over by round eight. 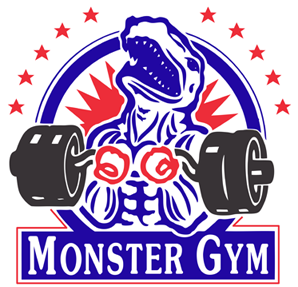 Freitas’ personal issues were apparently known to Barrios, who loudly trashed the champion’s appearances in commercials for shaving creams, shampoos and other products, and even teased him about his marital problems. 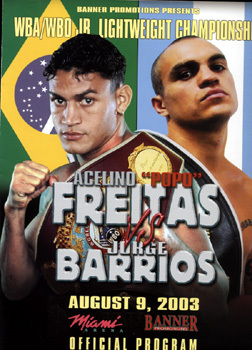 Barrios repeatedly said “papas fritas” (French fries) rather than “Popo” Freitas during press conferences, poking fun at the champion’s longtime nickname, and it visibly annoyed the usually-grinning champion. Some of the annoyance may have been evident in the opening round. A sharp start from Freitas veered off the path and he went wild, likely from a combination of Barrios’ awkward style and the pre-fight aggravation. Barrios was rattled by the champion’s attack, but he fought back hard in the second before being cut over the left eye in round three by a right hand Freitas had lined him up for. The action wasn’t one-sided, however, as Barrios landed smacking, pawing shots between leaping left hooks, and he was pushing the pace with volume and physicality on the inside, even if he was losing rounds. It was fast-paced, bruising action all the way. At the end of the sixth, blood in Barrios’ ear canal led the ringside doctor to determine he had a busted ear drum, but when asked if he wanted to go on, the challenger said the only word needed: yes. Continuing to rough up the champion when he could, Barrios’ left eye and cheek were covered in a stream of blood thanks to Freitas’ jab, but Barrios took care of that by actually dabbing his face on referee Jorge Alonso’s sleeve in the seventh. 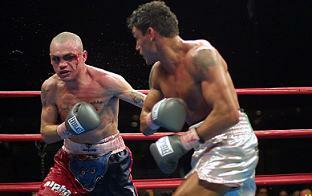 In round eight Barrios came back to land a strong jab that sent the champion down, unhurt, and shocked the crowd. Up and once again smiling, Freitas used his legs and made Barrios, who now had a slight cut and reddening over his right eye, chase him in rounds nine and ten. With the fight potentially slipping away, Barrios came back to land a one-two that scored a hard knockdown in round 11 and had Freitas spitting his mouthpiece to buy extra time, which he got. Barrios and Freitas go to war. Freitas held on in a panic, and Barrios attacked and mugged him on the ropes before slowing down in the final minute. Then, right at the bell, Freitas landed a right hand that completely fried Barrios’ circuits and had his body locked up before he crashed to the canvas. Somehow he got to his feet, but he had to be led to his corner where his handlers tried to revive him. It didn’t work. Round 12 began and Barrios, who clearly hadn’t recovered, almost immediately went down from a combination. 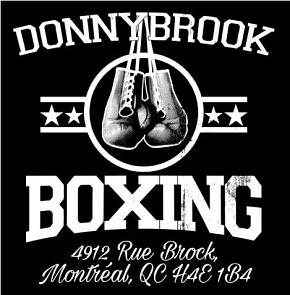 Showing tremendous heart, the challenger rose and tried to fight his way out of trouble, but a glancing right hand sent him to the canvas yet again. He got up on roller skates and the referee had no choice but to bring an end to the thrilling battle.